My instructions were simple and rattled on repetitively in my head; after traveling down U.S Route- 21, look for a gravel inlet and a broken stop sign, turn there, park and follow the rest of the way on foot. "You'll see other folks walkin"
The gravel inlet was actually an unpaved road with cars littered haphazardly along the sides. Being unfamiliar with the area, it took me a good 15 minutes before I got the courage to trek down the path with the "other folks". Wayward coastal breezes made the Palmetto trees sway surrounding me with the most fragrant scent, leading my feet to veer off the path a little. "Hey, you here for the boil? If so you're not gonna get there going that way." Says a gentleman watching me with amusement. "Sorry, I'm not from here." Quietly, I thank him, ask if I could follow and Jacob (my new friend) and I made our way down the road. About a mile and another new friend later, we walk up on a clearing with tables and people..
A colorful tableau of people. My eyes glazed over after noticing an array of desserts standing proudly on a table to my left. "That's not what you're here for" Jacob murmurs beside me. Sparing a quick glance in his direction, I inform him that after traveling several hours to the low country coastal town of Beaufort, South Carolina from my hometown in N.C , I'm here for something for sure. "You made it" She hugs me tightly and I return it with as much gusto; it's been a year since we've seen each other. "I wouldn't miss this for the world" is my response as a squeeze her hand lingering in her closeness a little while longer. Our table begins to fill with people and newspaper is laid in front of me in anticipation of what's to come. It's hard not to notice how diverse the people are that sit among each other like old friends. Across from me sits a sun visor clad little lady, in her mid 70's, whose shoulders were pink from the South Carolina sun. "That sun is bad for my eyes" she pronounces .. Then goes on to ask me at least 100 questions because she's never seen me before. A few minutes later she is joined by a a young man, tall with dark brown skin and kind eyes. He is very good looking so I shuffle a little in my seat. Turning to the sassy visor lady, this handsome stranger lowers himself in the seat beside her, with kiss on the check as she calls him her sweet boy. "His mama, worked for me and his grandma worked for my family.. Our families go way back" she says in adoration looking between the newcomer and I. He turns my way, shrugs his shoulders, shaking his head a little. A logo on his t-shirt reading "Gullah TV' grabs my attention and an anxiousness consumes me. "Can I talk to you about the Gullah Culture" I inquire ,perhaps a little too loudly as he stares at me then smiles. In the interest of time, I won't go into the conversation we shared. Truly, it needs it's own post, a series of post to accurately explain the importance of it. Something that sparked the flame in my desire to know more about the Gullah heritage. The Gullah people are descendants of the enslaved Africans that labored the rice plantations in the Atlantic coastal plains and the chain of Sea Islands in the United States. It's a culture, that includes it's own language, history and contributions to alot of the dishes I see posted on the internet but is hardly ever mentioned. It's my hope that this blog encourages people to explore the world of food from all perspectives, to learn the true journey that dish you are eating has taken. 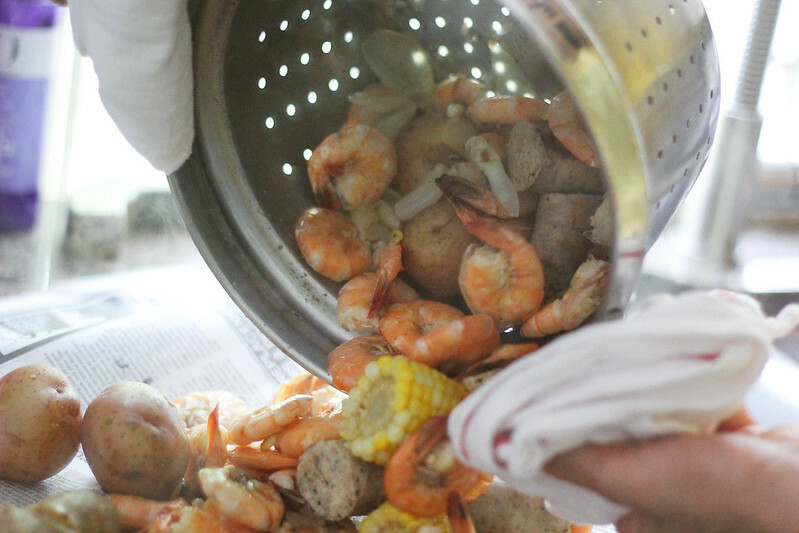 We are all engrossed in conversations as a group of people come into view, carrying large stock pots towards us, then proceed to dump mountains of shrimp, corn, sausage and potatoes that smell of spice and lemongrass along the newspaper lined tables. Immediately I realize that I had in fact been raised in the wrong area of the south. 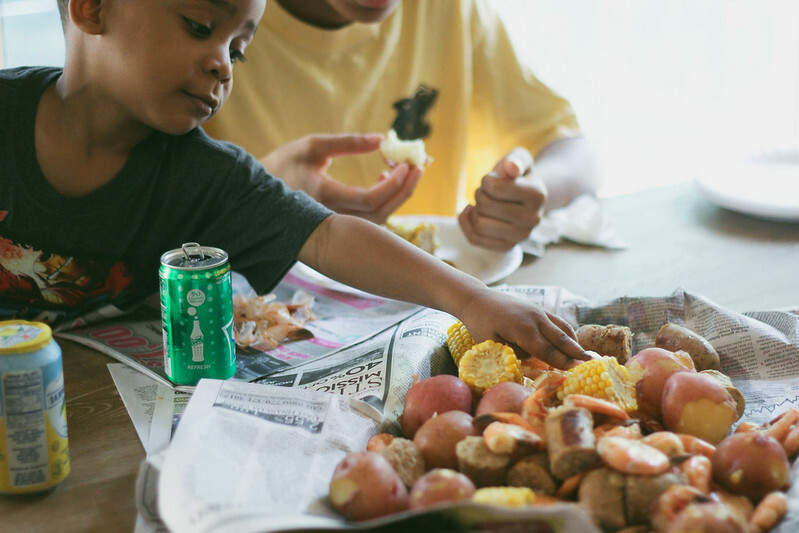 Where we praise the whole hog in N.C, proverbially dance around a pig as it roasts in expectancy of chopped BBQ smothered in vinegar based sauce, this seaside town climbs peaks of seafood and spicy sausage. I was in love and after about an hour, about to pass out from trying to climb that same mountain by consuming all in my wake. Wiping the wetness off my hands with paper towels, I notice a few people walking back with plates of pie and cake. No longer does the coconut cake hold the appeal it originally did upon first sight. Jacob leans over- "told you that's not what you were here for"
This recipe is very forgiving, as in, the measurement of ingredients are more specific to the cook. 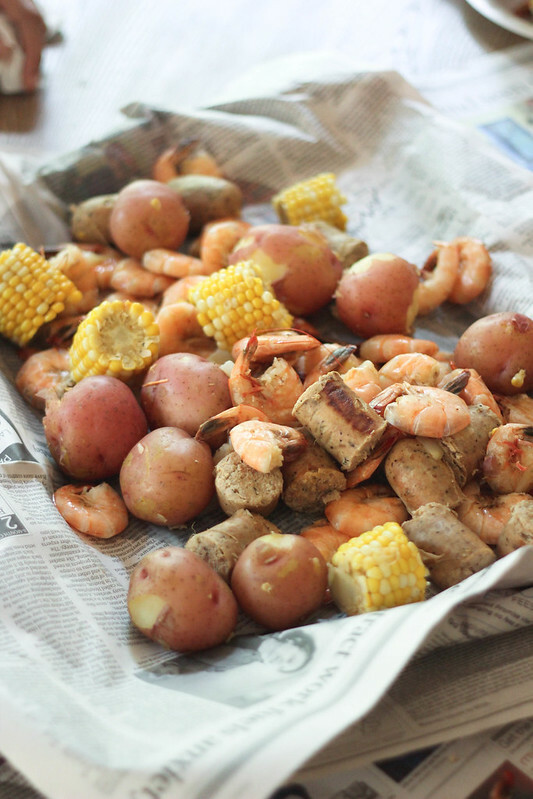 A low country boil is meant to highlight the summers’ peak and the freshest shrimp, corn and potatoes which are what really make this one pot of perfection sing. The sausage that I used is chicken from my local butcher, I also sauteed it before adding to the pot for my non pork- non shellfish eating friend that joined us for dinner. Normally I go for Andouille for a bit more kick, just adding it to the pot like the instructions say below. 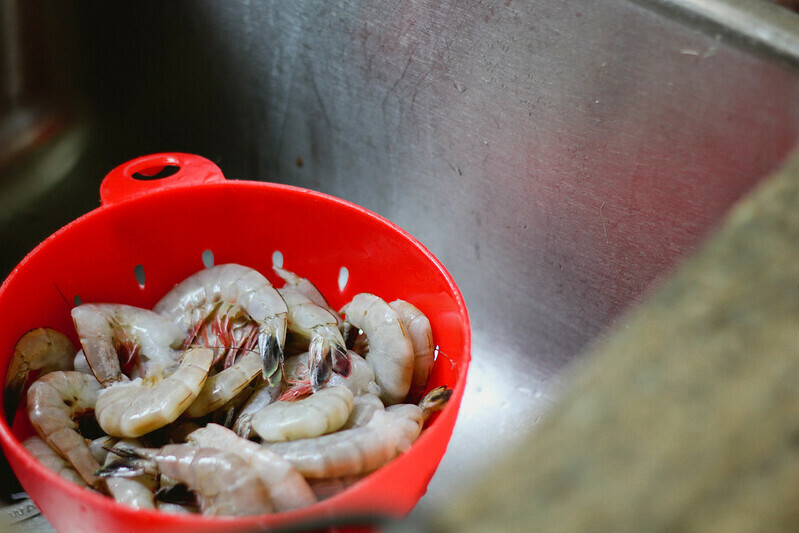 Traditionally, the shrimp is cooked with the heads still on. I'm noticing that is a something that freaks some folks out. Which I think is super strange since growing up everything we ate still had the head attached, from the fish to the pig. Bring a large stockpot of water (about 9 quarts) to a simmer. Add the old bay seasoning and kosher salt. Now add in the potatoes and sausage, boil until the potatoes are tender, about 15- 20 minutes. Bringing the water back to a slow simmer, add the corn, onion and cook until corn kernels are just a little softened about 3-4 minutes. You still want that bit of crunch when biting into the corn cob. 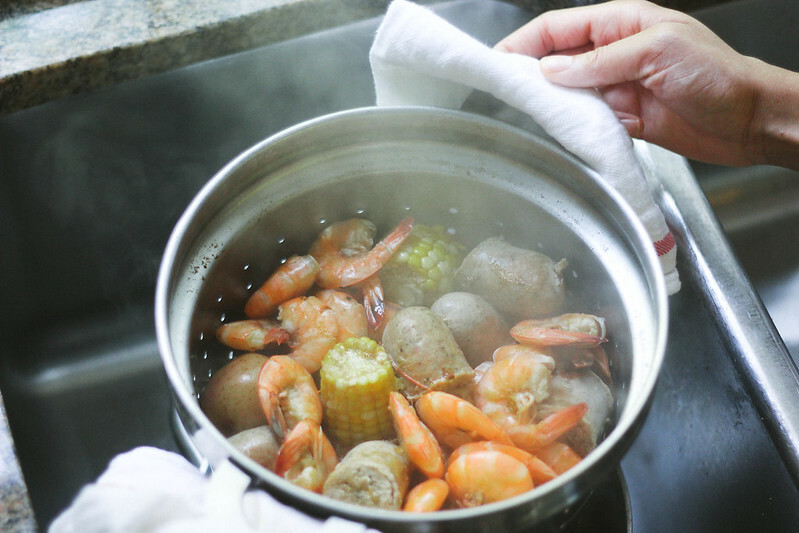 Add in the shrimp and cook (with the water still on simmer) until shrimp becomes pink and white, about 5 minutes. 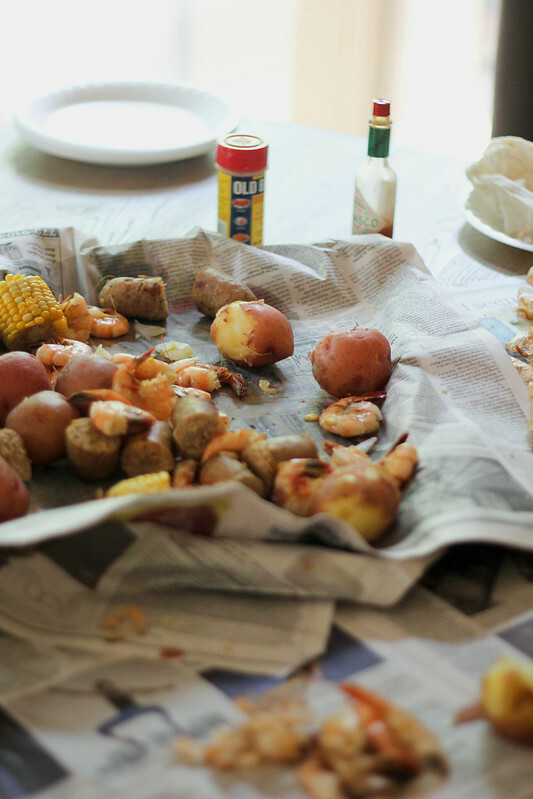 Remove from the heat and let stand for about 10 minutes, drain from the liquid and transfer to a platter or most commonly to the center of the table lined with newspaper. 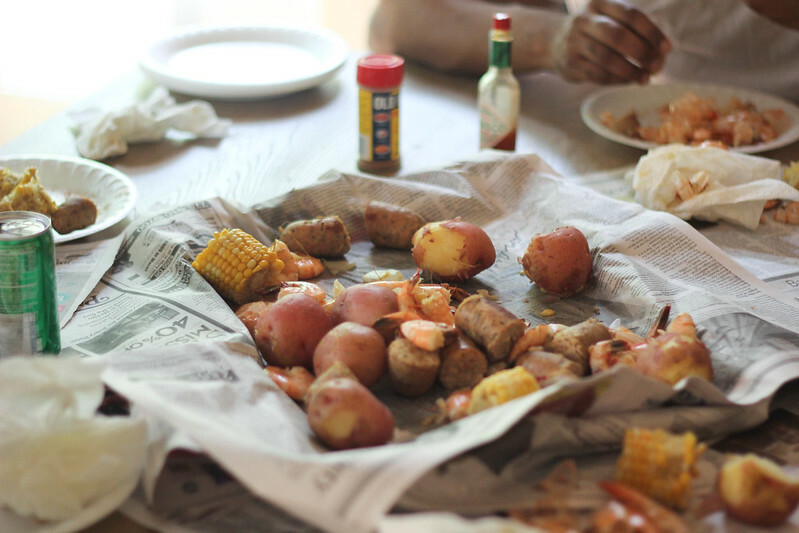 Serve with lemon wedges, Tabasco and more old bay seasoning. Along with butter and olive oil for the corn.